Last week it was announced that former UFC heavyweight champion Fabricio Werdum had tested positive for a banned substance and will be facing a 2-year suspension after being flagged back in April of this year. However, the specific substance that Werdum tested positive for, Trenbolone and its metabolite, leads me to believe that this is yet another tainted supplement case which we will probably be hearing more about in the near future. Out of all the possible PEDs and steroids you could use to enhance your performance in MMA, trenbolone is one of the worst possible choices I’d reckon. This is because it is well-known to wreak havoc on your cardiovascular system and this is due to several different reasons. Proponents of trenbolone may argue that tren increases red blood cell production, which it does, but it also negatively affects your cholesterol levels and well as raises your blood pressure which will affect your heart rate. Tren is also known to affect bronchial dilation, causing things like ‘tren cough’ and making it harder to breathe which will certainly have an impact on your endurance. Needless to say, in such a cardiovascularly demanding sport like MMA, using tren makes zero sense and you would have to be an utter fool to knowingly use trenbolone as an MMA fighter on any level, which is probably why you’ve never heard of anyone else popping for this before in the UFC. He said Werdum’s positive April 25 test was followed by a test 10 days later that came up negative, a reversal which he believes doesn’t indicate intentional use. If this is true, that makes it almost certain it was a negligible amount as Tren is reportedly detectable for up to 5 months after use, which is another reason why a competing MMA fighter trying to beat a test wouldn’t use it. 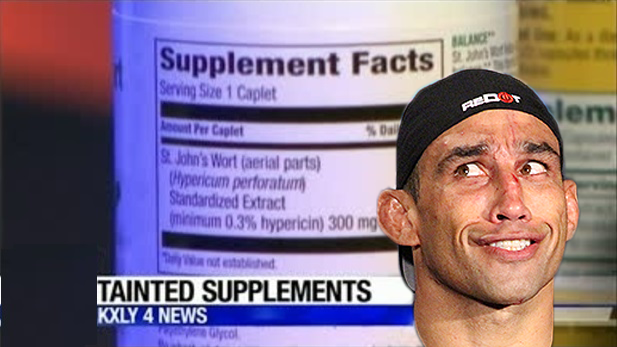 Time and time again we’ve seen fighters face harsh penalties as well as have their names drug through the mud over these kinds of tainted supplement cases, if that is indeed what has happened here. Perhaps USADA needs to change some of their policies regarding negligible amounts which really aren’t going to affect someone’s performance, much like they did with marijuana. The one good thing about these kinds of tainted supplement cases though is that it really shines a light on how dirty the supplement industry really is and how much in need of regulation it is. Under USADA’s current regime, it also makes little sense why competing fighters would continue to gamble with their career using supplements, which are known to have modest effects at best. Fabricio Werdum has yet to make an official statement regarding his test failure but has said on Instagram that the test failure is a ‘misunderstanding’ and he is working with the UFC and USADA to figure out how this substance got in his system.